The FP-LF is a fixed flat panel wall mount that can handle most displays 42" to 70". 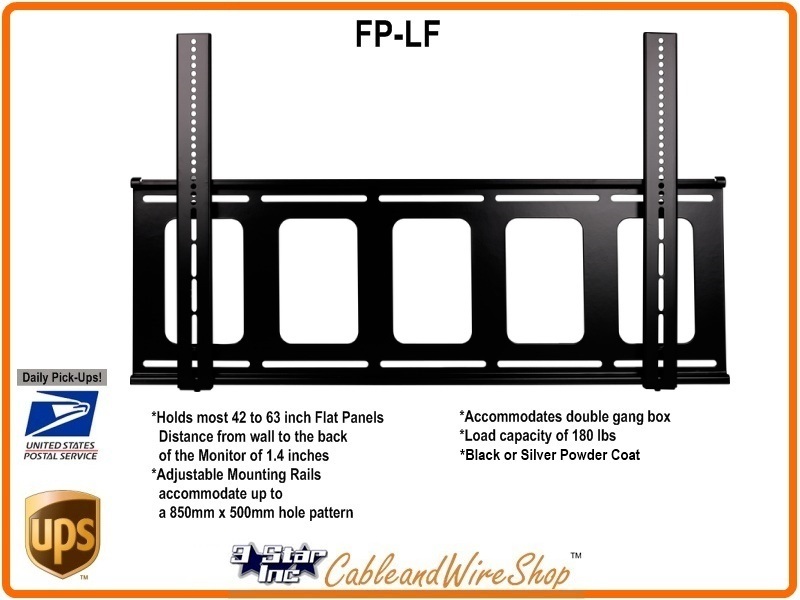 The FP-LF comes in silver or black (FP-LFB), has a 180 lbs load capacity and has only a 1.4" mounting depth. The rails of the FP-LF can slide left to right for perfect flat panel placement and easy installation. Adjustable mounting rails accommodate up to a 850mm x 500mm hole pattern and a double gang box. It has a Load capacity of 180 lbs. and comes in a Black or Silver powder coat finish. This mount is designed to attach to at least 2 studs up to 24 inches apart or other suitable support surface and primarily composed of formed steel, arc welded with security screws capability. Note: VMP continues to be recognized as the mounting systems company of choice for those discerning professionals who demand variety in a product mix as well as requiring dependable mounts and accessories. VMP mounting systems are capable of holding the largest and heaviest of flat panels while incorporating numerous tilt and swivel capabilities to meet the needs of any and every customer and installation.